Whether he's diving for fresh lobsters, sunken treasure, or just sight seeing, he'll love this watch. It's a kinetic so it doesn't need batteries. With an easy-to-read dial, grooved unidirectional bezel, and tough - but comfortable - urethane strap, this watch is ready for action. The case is stainless steel, and the quartz movement keeps correct time without frequent readjustment. 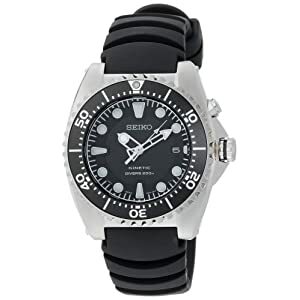 As a dive watch, it's water resistant to 200 meters (660 feet) which is adequate for just about any diver. Rugged and handsome, it's great for the active man.